The Madison Freedom Fighter: Cuba floods...Will Dems blame Socialist Fiscal Policy? Cuba floods...Will Dems blame Socialist Fiscal Policy? A BBC story points out that Havana had some pretty heavy flooding in wake of Hurricane Wilma. Sounds kind of familar. It seems as though the "sea defenses" were overtaken by the storm surge as the storm passed over Havana. Lets see how the American MSM covers this event and how Democratic politicians respond to his tragity. I know one argument that cannot be made: "The sea walls were breached because of a lack of social programs and weak federal supervision". Unless you didn't graduate from 11 grade Social Studies, you know that Cuba is in fact communist with a strong centeral government that controls almost every aspect of a person's life. "As these facts get out, and the American people learn that decisions were made not to fund improvements of the levees because of Iraq, they will not be happy," Washington-based Democratic consultant Chris Kofinis told the Associated Press. 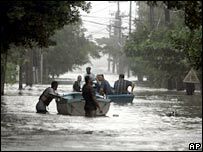 "Democrats searching for a way to blame President Bush for Hurricane Katrina are circulating a report that claims the Bush tax cuts and the Iraq war drained funding from New Orleans flood-control projects." Ahh, so the tragidy we call Katrina was caused by Bush and other greedy capitalist Republicans and evil freedom fighters, who is to blame for the flooding in Havana? There is a lack of captialists and freedom fighters in Cuba (Capitalists are hung and the freedom fighters fled to America!). I have an answer: lets blame NATURE. What a concept...blame the HURRICANE for the wind, rain, and storm surge! Is the National Guard "depleted because so many Guard are in Iraq that we don't have the opportunity to activate civil control? That question has to be asked." Mark my words, if one person dies is Cuba, the MSM will first blame Bush (global warming), then blame the military (for not getting our US aid there fast enough), and then blame Bush again (for not having a more open relationship with Cuba). After that, they will applaud the Cuban social programs that got the people back on their feet. Storms come, rain falls, levees break, sea walls are breached. It happens. Sometimes no one is to blame, but lessons are learned. Unless the MSM comes out and says the Wilma flooding in Cuba is caused by communism and isolationism, then Bush's fiscal or international policy is not to blame for Katrina.